Submitted by mabeldog on Mon, 09/07/2015 - 09:33. Submitted by lmcshane on Wed, 12/21/2016 - 10:59. Northeast Ohio residents must have a very short memory to forget that Russo's family ties include Marous Construction (Frank Russo's son -in-law) - the primary developer of the west side mega CDC -Detroit Shoreway Development Corporation. Detroit Shoreway residents Bobbi Reichtell and her husband Mark McDermott respectively run Campus District CDC (proponents of the "iconic" bridge construction) and Enterprise Community Partners, Inc. (low income and homeless tax credits). One of Mark's relatives is the Chief Planner at the Cleveland Metroparks. These are a few reminders of how nepotism in Northeast Ohio can easily morph into criminal activity - there are contracts for all of the projects outlined in this editorial. Bobbi Reichtell is also on the board of the Cuyahoga Land Bank (run by Gus Frangos/ shadowed by Jim Rokakis). She previously worked with Slavic Village Development Corp (read Forest City). The Land Bank has announced it will transfer the YMCA building to Cleveland Housing Network-Eden to apply for Ohio Housing Finance Agency dollars to build Permanent Supportive Housing (for homeless addicts) on the bluff of the Big Creek Valley--within spitting distance to the Cleveland Metroparks Zoo. Here is Mark McDermott's biography: Mark McDermott is vice president and Ohio market leader for Enterprise Community Partners, Inc. He leads a team of nine in delivering Enterprise’s programming and investment in affordable housing and community development activities in Cleveland, Columbus and throughout Ohio. Mark joined Enterprise in 1998 as director of Enterprise’s Cleveland office. He was promoted to vice president in 2003. Detroit Shoreway Development Corporation is the mega CDC (supported with CDBG funds by council reps Matt Zone, Brian Cummins, Kerry McCormack and Anthony Bracatelli). Anthony Bracatelli chairs the Cuyahoga County Land Bank. 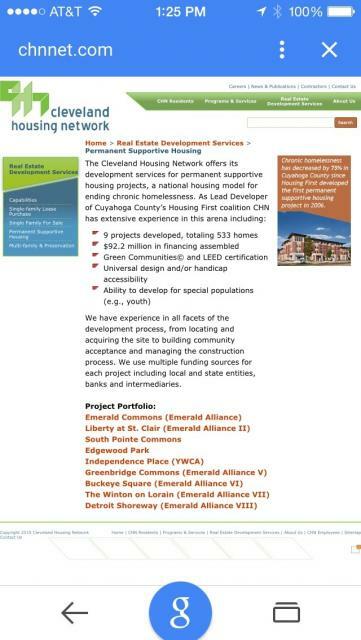 Every project that applies for OHFA funds includes a "developer fee" - no one really knows where that money goes. Brian Cummins supported the last low-income tax credit project in the Old Brooklyn Centre neighborhood - NRP's Foster Pointe. Ms. McShane – thank you for reaching out to us. The information you requested is below, please let me know if you need anything else! Developer Fee: This project has not received final underwriting.